History has yet to conclusively decide who is the undisputed the king of rock and roll (hint: It’s the Beatles), but the race for the king of Indie may already be won (yes, I know I mixed my metaphors, just stay with me here). The last decade and a half has been the age of Indie. There’s indie everything: Indie Rock, Indie Pop, Indie Bluegrass, lo-fi Indie, hi-fi Indie, and an indie designation for nearly every country and language. Such is the grandeur of the movement toward rejecting the degradation of society from bane and vacuous mainstream pop music–which I call the “Indie Movement”. But here’s the rub, with so many different types of Indie, is it possible to crown just one band king? Yes, yes it is. 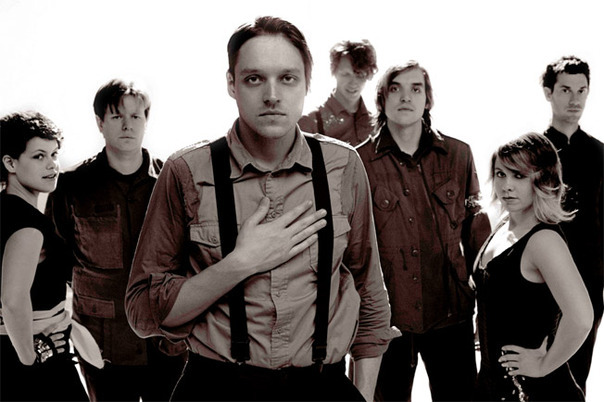 Arcade Fire is a singular “Indie” talent because with every album they redefine what it means to be Indie. They’re not just writing low-fi songs that are an “acquired taste” (read: Categorical music that has dubbed Indie “boring”). They’re also not straddling the pop line–selling out a little to get radio playability while reserving their deeper tracks for the Indie enthusiast (The Black Keys flirted with this on their last album). And most importantly, they’re not just writing songs that inevitably have to do with overdone themes (i.e. lost love, lost happiness, new love, new happiness). No, Arcade Fire is substance. They’re meaning and melody, without one overpowering the other. Their music carries an air that says, “We don’t care if you like this stuff. We like it. If you don’t, get out of the way and let us play”. Case in point: their Grammy performance in which they played Month of May as the credits rolled and producers cut transmission. I found Arcade Fire with 2007’s Neon Bible. Black Mirror, Intervention, Ocean of Noise. They pushed “alternative music” further than any music I had ever heard. I dug into Funeral and was convinced, this band was unique. Three years later, I heard the Suburbs and I was converted. Three years after their Best Album Grammy win, their newest album, Reflektor, only pushes the dimensions of “alternative” music further. They’re so far ahead of the pack with their musical innovation, it’s not even close. That’s the magic of Arcade Fire, and what makes them the kings of indie. They don’t monotonous mass produce radio-friendly hits that inevitably wear on you nerves after a few listens and end up driving you mad after a week. Their music is deep, enigmatic, and intense. It stays with you a fleeting memory and resurfaces like a forgotten memory. On Reflektor, none of the songs appear, at first listen, to be phenomenal, but each grabs you and pulls you in, until, without warning, you find the subdued beats and melodies echoing in your subconscious. Unlike overplayed pop songs you can’t get out of your head, it’s a pleasant experience. And the effect is not age discriminant. My pre-K son will often spontaneously start chanting the French echo chorus of Joan of Arc: Jeanne d’Arc even if it’s been days since he heard the song. Reflektor is further proof that Arcade Fire push the boundaries of alternative music with their lyrical depth and mastery of melody (alliteration is awesome). No doubt, we’ll be seeing an encore performance at the Grammy Awards. Let’s hope this time the producers don’t cut transmission this time.